So, what’s it like up there? I wish I had some picture of Heaven, so I could imagine you there, but I guess I’ll just have to wait. For now, I imagine you playing with Paul, Evan, and Honor. Tell them their big sister says that she loves them and can’t wait to meet them. Mom and I were talking the other day, and she said that it seemed strange, but that she actually misses you more now then she did when you first left. I replied that it’s because when you first left, the pain was in the thought of you never returning. Now the pain is in actually missing you. I can’t believe that it’s been six months. It feels like it’s gone by so fast, yet lasted an eternity. So much has happened, and yet so many things remain unchanged. I miss you so much, Josh. I miss talking with you, singing with you, dancing with you. I miss the happy, carefree days we spent together as children. The other day I was thinking about different things we did as kids. Our “Beanie Baby wars”, playing My Little Ponies, playing Eddyville, having you and Mom attend my “wedding”. We made so many memories together. I cherish those more than anything. I was also thinking about that morning – trying to remember the last thing I said to you. I’m still not sure what that was. The last thing that I remember was you asking me where the lunchbox was in the pantry. I told you, and you packed your lunch. And then…you walked out the door. I heard it close, but I had no idea it had closed for good. I’ve tried to imagine what you must have felt like. What you were thinking about. Were you thinking about those standing on the rocks, watching you? Were you scared? Were you thinking about your family, grieving your death? Of one thing, I’m sure. I believe that the very last thing you thought about was meeting God face to face. And I believe that you were excited. You have seen God’s face. Whenever I think about that, I start crying. You have been in the presence of God. The thought of you worshipping at the throne of God makes heaven and eternity so much more real to me. And the knowledge that you are still living gives me hope. I miss you so much. I never knew what it felt like to hurt like this. But I know – I know – that it was God’s plan to take you home. And that through doing so, you have changed the lives of thousands. You, Joshua Steven Eddy. You and your imperfections, your passion, your zealous love for your Savior. You and your love for others, your impulsive, cheerful personality. You and your quirks and gifts. You and your faith in God. Yep, well, I’m crying now. But don’t you worry about me. I’ll be okay. God has promised me that I will see you again, and I’m clinging to that promise. There is so much more I could say, but I’ll save that for another time. Thank you for changing my life. Thank you for being so good to me, Joshy, even when I didn’t deserve it (which was most of the time). You were a true brother, and I love you so much. what a wonderful story and i can tell that he was a wonderful human being.i can see gods gory in his face.his love for god must have been so great.god wanted him for himself and he took him in a bink of an eye.he didnt suffer.it happenend to fast.sometimes god takes his ppl to prevent what the devil has in store.but god had the upper hand and the glory.Joshua is so happy right now and cant wait to see u all.he s waiting ,but he is stil around u all.he is aand wil be ur guardianAnge,unti its time to meet again.i didnt know him and just saw it on fb,but even i cant wait to meet him in heaven and i will listen to al his stories and poems.i wished that u would put them al together aand publish it.it is his legecy.whie i wrote this my pc shut down and i know it was the devi,cause he didnt like that i ll write u.but he couldnt hold me back and i tried to go back to his page and found this.it is awesome.i feel ike crying but still rejoicing,cause i cant imagine how u al fee and go thru it.i lost oved ones and the pain is always there.but we are blessed and have the hope and security to meet again.and thats awesome.be blessed and may god and Joshua be with u always.love and blessings.just a regular christian fb reader.my name is Petra and it is an honor to read this story.amen and amen. 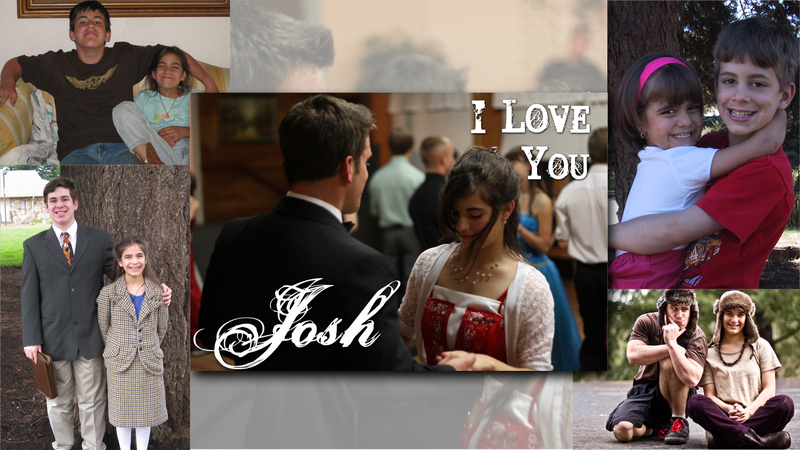 So wonderful... your love for Josh pours through every word. I'm... awed. Beautifully put! Mariah, My heart aches for you and yet God is holding you through this time and He will not let you go. Hope of heaven...yes..and because God is sovereign, hope for joy, laughter, and healing on this earth. It will come. In time. We shall never forget and Josh's legacy shall live on. Praying for you and sending you an extra big (((hug))). Wow! I grieve with you in the loss of your brother. I have never met you, but when I first heard about his death I started crying. Reading more has made my heart hurt for your family. I am so blessed to see that through this trial, you are learning more and clinging to God. Thank you for this beautiful post. You have taught me a lot. I think God really used your brothers life and death in a mighty way to glorify Him. I will pray for your family and I hope to meet you one day.